CDAC scientists recently participated in a workshop entitled "Basic Research Directions for User Science at the National Ignition Faclilty (NIF)," from May 10-12 in Arlington, Virginia. The purpose of the workshop was to explore new scientific opportunities that will be possible with NIF, the world's largest and most powerful laser, which is located at the Lawrence Livermore National Laboratory. The workshop was convened by John Sarrao (Los Alamos National Laboratory), Kimberly Budil (Lawrence Livermore National Laboratory) and Michael Wiescher (University of Notre Dame). Scientific areas that will benefit from the capabilities of NIF include Laboratory Astrophysics, Nuclear Physics, Materials in Extremes and Planetary Physics, and Beam and Plasma Physics. Within each topical area, panelists summarized the status of the field and proposed opportunities for new and groundbreaking science. CDAC Director Russell Hemley chaired the Materials at Extremes and Planetary Physics panel and discussed the importance of NIF to understanding atomic and molecular interactions at the most fundamental level. 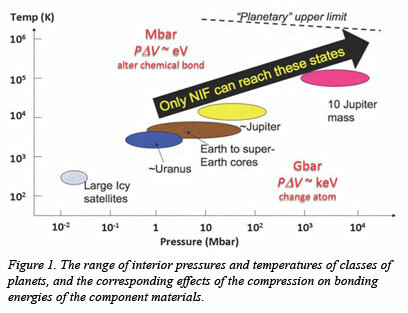 States of matter approaching the Gbar pressure range will be possible with NIF, states in which the very nature of matter is unknown (Fig. 1). This will lead to increased understanding of key problems such as the nature of materials strength, the origin and evolution of planets, and the process of thermonuclear fusion. CDAC participants in the Materials panel included academic partners Tom Duffy and Raymond Jeanloz, Carnegie staff scientist Alexander Goncharov, steering committee members Rip Collins and Marcus Knudson and advisory committee member Yogendra Gupta. The Materials panel also included Paul Loubeyre, Sarah Stewart-Mukhopadhyay, Alfredo Correa, and Justin Wark. Integrating results from static and dynamic compression measurements for stockpile stewardship science has been a key goal of the CDAC program since its inception in 2003. With this outstanding new opportunity for advances in the field of extreme conditions science becoming available in the near future, CDAC will work to facilitate the coordination of the emerging user community and help to develop key scientific directions. For the first round of user science experiments at NIF, a UC Berkeley-Carnegie collaboration has been awarded time for work on hydrogen and hydrogen-containing materials at extreme conditions. For more information on this collaboration, see a related story here.